Pure PTFE Teflon® Packing : PTFE Teflon Gland Packing, PTFE Graphite Packing, Pure Teflon Packing Manufacturer, PTFE Teflon Graphite Gland Packing, Aramid Gland Packing. 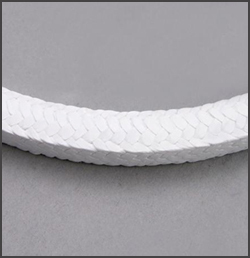 Pure Teflon® packing rope is Flexible, almost completely chemical inertia, dimensional stable, low coefficient of friction and excellent resistance to compression. It is suitable for all the chemical compound, alternative & rotary motions shafts, rods, piston valves, steam, expansion joints. It is a Braided Packing made of pure P.T.F.E. Yarns. Application: It is a cost-effective replacement of PTFE impregnated asbestos packings. PTFE 100% square packing is a self-lubricating, chemically inert, non-toxic, and a non-hazardous material. It is very flexible packing and provides more efficient sealing with very low friction characteristics. This packing can be used against corrosive chemicals, solvents, oils and petroleum by products and oxygen service widely used for water handling equipments, liquid oxygen pumps, valves etc. Other sizes & specific lengths can be supplied as per customer's requirement.